This is a strangely remote part of East Anglia, the uncompromising rivers dictating the landscape, and the roads rushing through to Norwich without much regard for the villages and hamlets lost in the rolling meadows and copses beyond. Not far from Langley is the slightly bizarre sight of the huge sugar beet refinery at Cantley, midway between Norwich and Yarmouth on the River Yare. My grandfather worked there when he first came to East Anglia in the 1930s. It was always inended to be reached by river and rail rather than road. Langley is on the other side of the river, and although the silos and chimneys appear from time to time above the rise, this is a quiet place, one of the small, ancient parishes created very early on in the colonisation of this island by the English. In the 18th Century, rich landowners found this secretive area ideal for farming, shooting, and the conducting of extra-marital affairs, and so there are big country houses, some of them spectacular, and again relatively little known. Here at Langley is the splendid Langley Park, built by Matthew Brettenham for the Berney family, and today an exclusive public school. At the other end of the parish, on the banks of the river, are the remains of Langley Abbey, and in between the two sits the church. St Michael is enclosed within its own copse of trees, only the top of the tower giving the secret away. Nearby is Langley Grange, splendid enough in its own way, where we found the key to the church. To get to the church, you have to cross a broad meadow on foot, and part of the way across is an intriguing memorial stone for the journalist Deborah Hutton, who died in 2005 at the age of 49. 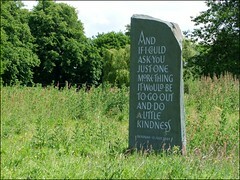 The inscription reads And if I could ask you just one more thing It would be to go out and do a little kindness. Deborah 13 July 2005. I thought this was touching and lovely, and still deep in thought I squeezed through the narrow gap into Langley graveyard. The church is perhaps not the most attractive or exciting in Norfolk, but it possesses a quiet gravitas in this enclosed space. The exterior character of the church comes from a rebuilding in the 14th century and a restoration very early on in the 19th century. Almost certainly, there was a Norman church here once, and before that a wooden Saxon one, for these are the oldest English parishes of all. But the important thing about Langley church is inside, for this is one of several churches in this part of Norfolk which are home to parts of the Beauchamp Proctor collection of continental stained glass, and this is the largest and best grouping of them. The Beauchamp Proctors lived at Langley Park in the late 18th and early 19th Centuries, and the glass, much of it from Rouen in France, was imported for them by JC Hampp of Norwich. 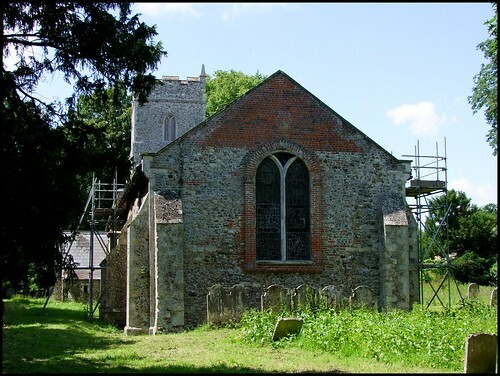 As with Chedgrave and Thurton, it was installed by the early Lowestoft stained glass designer Samuel Yarrington, and probably restored in the 20th Century by the King Workshop of Norwich. The best are the roundels, and the best of these depicts Mary Magdalene meeting the Risen Christ in the garden and mistaking him for the gardener - not surprisingly, perhaps, as he wears a gardener's hat and carries a spade. The best of the larger panels depicts the shepherds on the hillside with the angel appearing to tell them of the birth of Christ: one of the shepherds sits and plays his bagpipes. The chancel was rebuilt as part of the early 19th Century restoration. Pevsner says it was re-Gothicized in the later C19, but it retains its Georgian character under a ceiled roof, which was unfortunately breaking away and falling to the floor at the time of my visit, the whole east end of the church cordoned off as a consequence. But I took my life in my hands to photograph the glass you see above. The interior of the church is rather gloomy, I fear, and this was a sunny day. Still, this lends a seriousness to the Beauchamp Proctor memorials in the chancel. The best, and saddest, is to the children of Sir William and Dame Anne, who died in the 1820s. One of them, the six year old Emma, died in Paris, and was buried at Pere La Chaise. The war memorial opens like a triptych, and the names painted on it must have been of estate workers, mostly. It seems inconceivable today that such a small, lonely and sparsely populated parish could have lost so many of its young men. Nearby is a curiosity: a blank recess in the south nave wall, covered by an ornate grill. The headstops appear 14th Century. What on earth was it for?